Gone are the days when taking a step out into wide blue yonder meant that you had to leave your privacy amenities behind. The secure changing rooms and spacious showers often become a thing of mystery whenever you decide to go camping for a few days. 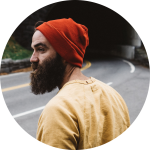 For many years, I’d hated the idea of having to use public shower facilities or at times head into the woods just to have some private time like taking shower, changing clothes and getting some personal cleanliness done. Fortunately, my camping experience took a turn for the best with the introduction of portable shower tents. To me, they’re more than just a shower. I call them the portable privacy shelters. 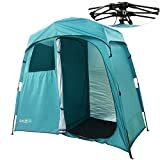 And since camping (portable) shower tents come in handy for several occasions, here’s a detailed buyer’s guide and reviews on some of the best camping shower tents to help you make an informed decision when shopping. Another great nominee in being the best portable privacy shelter on my list is the KingCamp Oversize. 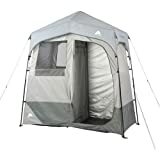 This shower tent offers you a safe and stable structure that you can use to shower or change without worrying about the wind or bad weather. A true definition of a multi-purpose tent. Designed with for multi-purpose functionality, you can use this tent as a changing room, shower tent, camp restroom, portable toilet tent, or simply as the camping privacy tent that can be used for every activity such as praying. Its large of 66” (W) × 66” (D) × 85” (H) is a plus for camping families as it is taller and wider compared to other models, and can comfortably accommodate up to two adults. Another amazing thing about the KingCamp Oversize privacy shelter is its nice piece of engineering. To begin with, it is made from a durable polyester fabric that offers the best level of privacy and you won’t have to worry about the tents durability. Then there’s the easy setup, thanks to the fiberglass pole, ropes, and pegs that offer enough strength for supporting the basic functionality features. It is also fitted with large zippered doors and two mesh side windows, the tent is well ventilated and can be accessed easily. You’re also assured to benefit from a shower bag capable of holding 5 gallons of water so you can keep your entire camping family clean and fresh. If you’re planning on going on a camping trip for a couple of days and you’re thinking of a convenient privacy room that would fit your budget quite nicely, then you a may want to look into the WolfWise Pop-up shower tent. The WolfWise portable tent works perfectly as a portable shower or changing or restroom for your great outdoor trips. Made from polyester, this tent is reliable under all types of weather and offers the desired level of privacy. Setting it up is also quick and easy thanks to its pop-up design that erects itself automatically as it unfolds and easily collapses to a lightweight, compact size package. Being among the widest and tallest size available on the market, it offers the finest showering and changing space. The versatile Browning Camping camping shower tent is another great shelter for anyone thinking of getting a portable privacy shelter for the great outdoors. This tent is designed with basic functionalities that will suit your camping needs. It can be used to serve several purposes which include showering, changing as well as a washroom. The tent as a wider base at 5’6″ x 5’6″ and a convenient height of 7’2″ at the center. It is designed with fiberglass poles and steel uprights that are strong enough to withstand the pressure that may arise from wind and bad weather. The polyester fabric is also strong and opaque to assure you of maximum privacy and durability. Besides, it comes with several storage pockets to help you organize your belongings for convenience. Then there are the retractable floor and mesh roof vents to keep the tent clean and well-ventilated. 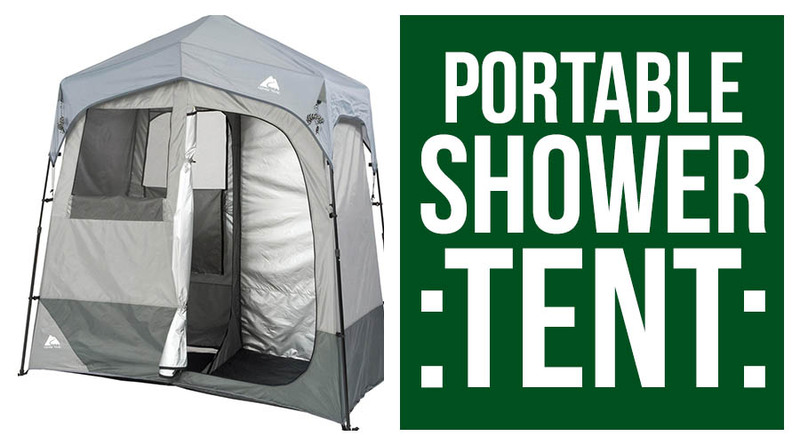 The Texsport portable privacy shelter (87″H x 4’6″ x 4″6″) is basically a multi-purpose changing room, and you’ll be impressed by how much convenience it can add to your next camping (outdoor) adventure. It has been designed to help you find the desired privacy when you’re out in the wilderness. Since no one loves the idea of using public facilities, this portable changing room is ready to offer you private space for showering, changing and toileting, all from this one compact pop-up unit. This tent also comes with a towel rack and a five-gallon solar shower. It is made of a durable fabric – heavy-duty polyurethane-coated taffeta that can withstand most weather conditions. The strong steel poles are also designed to hold the tent’s weight in place and are built to last and still features rust-resistant and chain cording components. 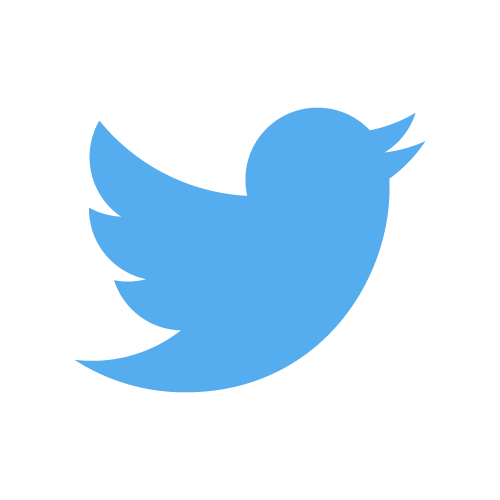 The steel framing (pole) also means it’s a fully durable tent that you can use for many years. Thanks to the zippered storm door (flaps), mesh windows and roof panels the portable changing room is well ventilated and comfortable in all weather conditions. Instead of getting a portable room that’s is designed for no defined purpose, why not get one that is? 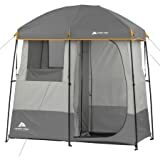 The Ozark Trail 2-room shower tent is a purposeful compact privacy shelter with two area, one for changing or toileting and another for showering. It’s generally easy to set up and very easy to transport too. The fabric is coated to ensure you have the best level of privacy to ensure no part of your body is exposed. The room is also well-ventilated thanks to the two mesh windows that allow efficient air flow in and out of the tent. And with its innovative pre-attached instant frame design, setting it up will be quick and easy. For showering, the tent comes with a five-gallon tank that can support solar heating for your convenience. It also offers enough space for all your activities that would require maximum privacy. Moreover, it’s durable, lightweight and relatively affordable. If you looking for a more purposefully privacy room for your next camping trip, you may want to look at the 2-Room Non-Instant Shower Tent from Ozark that is designed to suit your family interests. Standing at 7 feet high, this camp shower tent offers the best shelter when you need to take care of your private business. It is big and has enough room capable of offering comfortable accommodate through your private business. And with its innovative pre-attached instant frame design, setting it up will just be a matter of seconds as it unfolds and collapses quickly. For showering, it comes with a solar shower that’s capable of holding up to 5 gallons of water and the capability to heat water quickly under the sun. The tent also includes a separate utility/changing room that you can use to change so that your clothes don’t get wet when you’re showering. As for the design, the tent is simple and really sturdy. The entry doors have zipped flaps, which are of good quality. The tent’s fabric has been coated durable polyester which offers the best waterproofing capabilities and can withstand harsh weather conditions. With the fiberglass poles and the light fabric, the tent is more durable and with a much-reduced weight for easy portability. 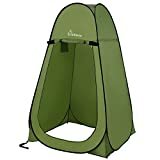 If you’re looking for a double roomed pop-up shower tent (size: 94”x47”x81”(H)) for your camping trip, then you should look at the Quictent pop-up tent. 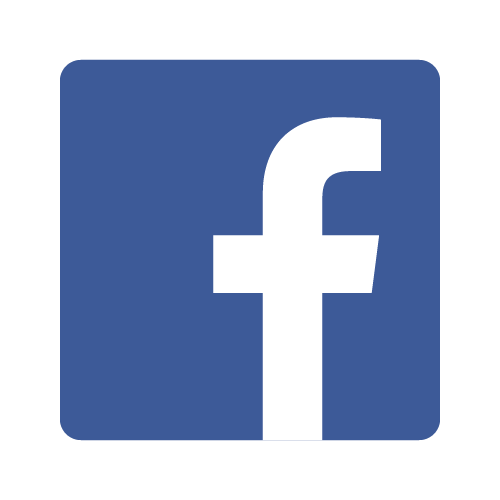 A special model design with basic functionality features. 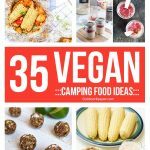 Something to make your camping adventure light and more meaningful. The Quictent 2-Room Pop-up Shower Tent is one of the best portable privacy shelter on the market today, as it offers enough space for showering, toileting and changing. Setting it up is also easy as it designed with the innovative automatic rod bracket, and you won’t require any special tools to put it up. Besides, it’s made from an Anti-UV silver-coated durable Oxford fabric that offers the best level of UV resistance and is 100% waterproof. Supporting its weight are the sturdy fiberglass frames which are abrasion resistant and more stable and stronger than the common steel poles. With a 5-gallon solar shower bag and spacious a shower, the Quictent tent may just be your ideal portable shelter for your next trip. Before we go into our best shower tent review, it would be better to take a look at our detailed buyer’s guide for some key hints to help choose the right tent that will suit your needs. Something specially designed for camping and other outdoor trips. First, consider the design of your ideal shower tent because the designing will determine the purpose of the tent. 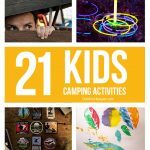 Some campers will be looking for a single-purpose shower area, while others will be looking for an all-purpose design for showering, changing and perhaps sleeping. It all depends on what you think suits your needs. There is a wide variety of designs in the market today. You just have to go for what you need. That’s all. The size of the shower tent is another vital factor to always take into consideration when looking for an ideal camping shower. You don’t want to be showering or changing with some parts of your body exposed. 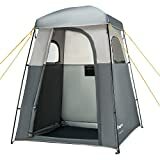 The best shower tent should have large flaps (entrees) for easy access, as well as being spacious enough for comfort and flexibility while changing or bathing. Some models also have more capacity (double roomed) for convenience. As for the size and shape relationship, most models rise up (6-7 feet long) and then becomes slimmer closer to the top, making a dome shape. This will give enough space to not only remain standing when showering and dressing but also rest in your sleeping bag (for the multi-purpose models). Don’t dwell much on size and forget about the tent’s overall weight. Like any other camping gear, you’ll need to take the weight, foldability, and portability seriously because you’ll be hiking with it. This means you should go for models that are lightweight and can be folded into a compact size for easy portability. Most tents come with carrying bags to make them easy to carry. You should also understand that bulkier shower tents often come with additional features, and this would require you to base your shopping guidelines on your mode of transport and what your camping family prefers. Since you’re buying the shower tent for privacy reasons, you’ll also have to consider the degree of privacy it offers. You’ll, therefore, consider if the tent is opaque, translucent or transparent. And yes, choose a shower tent with an enclosed rooftop and opaque material to get the best level of privacy for you and your family. The tent should have enough ventilation vents for smooth airflow that will keep the tent clean and fresh. You don’t want to change or flash or shower in a frowzy space. Side windows and top and mesh roofs are the most effective ventilators. The quality of material used to make the tent speaks volumes about its durability, portability, and level of privacy. Tents made from waterproof, durable fabric (like polyester) barely gets damp and dries up quickly after being exposed to wetness. You should, therefore, choose shower tents that have waterproof fabric and are strong enough to withstand the scorching UV rays, besides being opaque for maximum privacy. For added convenience, the fabric should be easily foldable with a smooth inner lining so you don’t scratch your skin. Shower tents are built for two basic reasons, showering and changing. This means the right tent should be come with storage shelves, bags, hooks, clotheslines, and mesh shower racks to fulfill its intended purpose. Some shower tents are designed with trays that are used to capture the shower run-off, while other come with open (mesh) bottoms for the water to escape easily. You’ll, therefore, have to do your research properly and get the right tent. In most cases, tents with water capture trays are used in campgrounds where shower runoffs aren’t allowed. Hence, you’ll use the tray to collect the runoff and safely deposit it elsewhere. However, tents with open bottom allow the water to drain away. Camping shower tent will either have a pop-up design or a rigid pole assembly. The pop-up shower tent is the easiest to set up since it erects itself automatically as it unfolds. All you have to do is stick it firmly into the ground to secure it. I love the pop-up tents because of their lightweight and packing them is much easy. On the other hand, the rigid pole designs may take you several minutes to install, but their stability is worth it. They are more durable and studier, making them ideal for a campground with a lot of wind and bad weather. Their rigid poles are designed to take up the weight of solar shower bags. Speaking of the most important factors to put into consideration, the source of water is another key factor. You need to establish if your camping site is close to a water source, whether plumbed-in units or natural running stream. If not, you may want to look into portable showers with tanks to allow you to run the unit using pre-collected water in a container. Solar powered – heats water using the power of the sun. Propane powered – offers quick and easy access to hot water. Battery powered – uses battery power to heat the water. Whichever option you go for, you’ll need to take consider how long system takes to heat water to full capacity and some of the pros and cons associated with it, including the cost. Once you’re done taking the aforementioned key factors into consideration, it would be of great importance to also take the budget and warranty offers seriously. Make sure you get something worth your interests. That said, here are some of the best portable shower tents for your camping trips. With these shower tents, privacy in a camp should never be complicated. Portable privacy shelters are very convenient and usually pack well, besides being affordable and easy to use. Moreover, with our guide, finding the right camping shower tent doesn’t have to be a challenge. The information is meant to guide and help you choose from the different models available today. We have also reviewed some of the best models to make your shopping easier and get whatever is best suited for your needs. Whichever model you choose, we hope that you find our guide and reviews very useful. The KingCamp portable privacy shelter stands out as my best shower tent since specially designed as a portable privacy shelter. It can be used as a shower, changing room, and restroom for the outdoors. Very spacious and strong enough to withstand all types of weather.